Alzheimer’s Research UK has just produced a fantastic new leaflet entitled “Why research using animals can help defeat dementia” (click below to download). Dementia affects 820,000 people in the UK, so it’s important that it continues to get funding (mainly from donations). 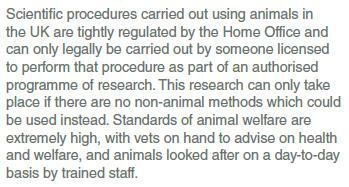 Nonetheless, to help their stakeholders understand why they use animals, they have created this document. 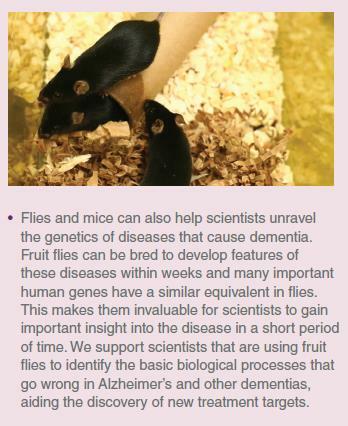 Throughout the leaflet there are pictures of mice and fruit flies, reflecting the main species used by Alzheimer’s Research UK. The leaflet makes three particularly important points about animal research. The leaflet is clear on the regulatory framework. The Alzheimer’s Research UK website discusses many individual cases where animal research has yielded important insights into this disease. For example, last year they announced that ARUK funded scientists at the University of Southampton had studied GM mice to discover why a particular genetic variation increases the risk of developing Alzheimer’s disease, and they are currently funding a project at the University of Cambridge that will use the fly Drosophila melanogaster to study how aging affects the amyloid protein that forms plaques in the brains of people with Alzheimer’s disease. Alzheimer’s Research UK is not the only charity to be proactive in discussing animal research (though they are probably in a minority); In 2011 the British Heart Foundation ran the Mending Broken Hearts Campaign which discussed why zebra fish are important to researchers looking at heart disease. Similarly, Cancer Research UK wrote a long article on their blog in 2011 entitled “Animal Research is helping us beat cancer” – while only a start, such actions play an important part in informing public opinion. Hopefully more charities will follow Alzheimer’s Research UK’s approach of openness in explaining how and why they used animals in research. Posted on June 10, 2013 November 1, 2013 by EditorPosted in News, Outreach NewsTagged Alzherimer's Research UK, animal research, animal testing, dementia research, outreach. Previous Previous post: What if animals could tweet? This is really, really good. Lets hope this continues!